Learn about the Allergiene™ cycle on your new front load LG washer. 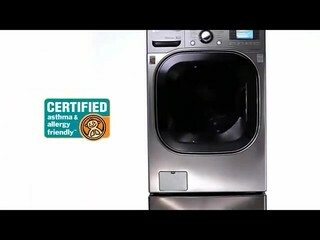 Presenting the first washer certified asthma and allergy friendly by the Asthma and Allergy Foundation of America. LG's exclusive allergene cycle uses the power of steam to gently remove over 95% of common household allergens like dust mites and pet dander. Because the cycle is shorter and less hot water's required, the allergene cycle is gentle on fabrics and can be used as often as needed on clothing, baby wear, bedding, pillows, and more. Plus, when compared to the washer's sanitary cycle, allergene will use significantly less hot water and electricity. When you consider a washing machine that protects as it cleans, you'll wonder, is it a washer, or something better? LG. Life's good.